I’m not sure how I originally discovered Girl Hearts Girl. I’m guessing I must have seen something on YouTube or maybe Instagram. 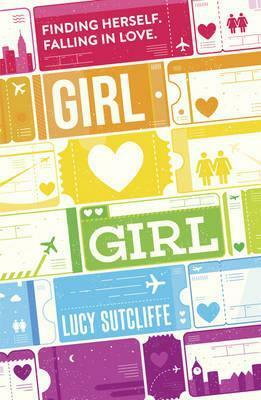 I had a note for months on my whiteboard that said ‘Lucy Sutcliffe’ and when I finally looked her up, I discovered this book and thought Pride Month would be the perfect time to read it. Girl Hearts Girl is the story of Lucy Sutcliffe growing up, figuring out she's gay, and dealing with those confusing, scary feelings. It’s about her friends, her family, and eventually her long-distance girlfriend, Kaelyn. I think the synopsis is a tad misleading - it sounds like this is ‘their’ story - how they met, fell in love, got together - and if someone picked this book up because they were a fan Lucy’s and Kaelyn’s YouTube videos, they might be disappointed to learn the first half of the book is about Lucy’s experiences growing up. Personally, I enjoyed reading about her younger years, but then I had never heard of Lucy and Kaelyn and knew nothing about their YouTube videos. I just liked that Lucy was a regular kid - kinda weird and nerdy, and obsessed with Harry Potter, like me. I’m glad we got to see a lot of her struggles as a young teen before the romance aspect came into play because that could have easily overshadowed some of the important bits about friendship and finding acceptance at a younger age. I also appreciated that Lucy talked openly about her anxiety and eventually seeking help. People are starting to talk more openly about mental health and we’re seeing it dealt with a bit more in fiction, but it was a nice surprise to see it in this book, and it helped me connect to Lucy even more. I felt for her in a lot of ways - worrying about fitting in, being self-conscious about being weird and different, and then struggling with the myriad of emotions surrounding realizing she likes girls. She made herself sick over thinking there was something wrong with her and worrying what people would think, and I’m sure a lot of people will be able to connect to that. While I identified with Lucy in several ways, I had trouble connecting to the writing. The style was very simple - almost too simple. Because of the simplistic writing, this book could be read by anyone at any age, but I found myself wishing for a bit more depth. Usually in a book like this, you’d get a lot of profound realizations and poignant discoveries, and while there were a few inspirational moments, I wanted to feel more, connect more with Lucy. I also wish that because half the book was largely about her relationship with Kaelyn, that we’d seen more of their relationship. I know they were long distance for many years, but it would have been nice to see more of the emotional side of things. Also, while I get that this is a memoir and Lucy can only talk about her own personal experiences, I felt like the whole thing was a bit idealistic. She dealt with very little homophobia (which is obviously great, and I’m pleased for her) and a few times things were said by other people along the lines of no one cares anymore if you’re gay, or it doesn’t matter to people anymore, but that’s simply not true. Sure, there are plenty of wonderful, accepting people - more now than even a decade or two ago - but there’s still a lot of homophobia out there. A lot of hateful, hurtful people. I would hope that most people have the good experiences and support Lucy did, but it’s often not the case. It’s nice to see good experiences and know they’re possible; people, especially younger people who are just discovering their sexuality or deciding to come out, deserve to see the good side of things, but I think it can also be harmful and misleading to think it’s always that simple or that safe. That being said, I did appreciate how Lucy mentioned that once she and Kaelyn started posting their videos, they got a lot of letters, including from gay teens in places where you could be jailed or even killed for being gay, and they said how inspirational the videos were and how much they helped them. Lucy does acknowledge her good fortune and privilege to have dealt very little with homophobia, and to live in a place where it’s mostly safe to be out, which was nice to see. Overall, I enjoyed Girl Hearts Girl. It was sweet, funny, and had some touching and inspirational moments. I liked the overall message of finding the people who love you for who you are, being true to yourself, and finding the inner strength to carry on no matter what. I’d recommend this to teens and young adults, especially those who are uncertain about their sexuality or who are thinking of coming out/starting to come out/are newly out. I think many people will find comfort and inspiration in Lucy’s journey. She’s just a regular girl who goes through many of the normal pains of growing up, and for a lot of people I think it will be comforting to know they’re not alone. 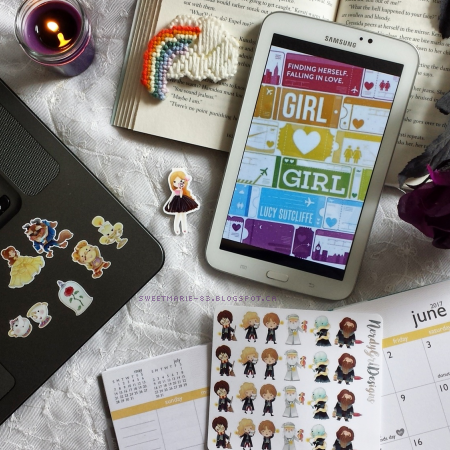 Have you read Girl Hearts Girl? What did you think? If you haven't read it, do you plan to? Do you read non-fiction?